I’m sure you’ve read on your shampoo bottle to wash and repeat. I’m also sure you’ve thought, that seems like a waste and you’ve completely ignored it. Well, I’m here to tell you, I used to ignore that instruction as well, but I’ve reformed my ways and I’m now a double washer - because there is a reason for it! With Monat, your first wash helps breakdown any buildup on your hair. Your second wash, actually cleans your hair follicle! Without two washed, the shampoo can’t get to your head and scalp to actually clean because there is too much gunk in the way. Who knew! 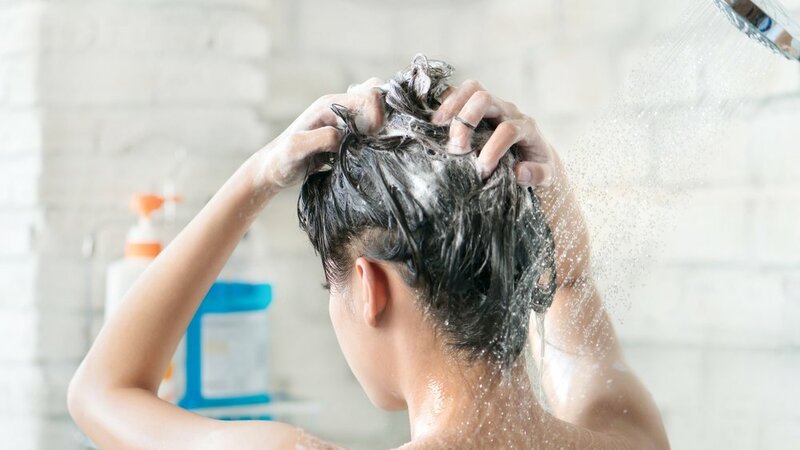 It’s important that you follow the directions when washing your hair with Monat products so that they can do their job to make your hair beautiful. I like to make the most of my hair washing days by turing my shower into a mini spa. Here’s my hair washing routine! Obviously, you’ll want to get your hair wet before you apply your first shampoo. You’ll want to get about a dime-sized amount of shampoo in your hands. Then add some water - I like to stick my hand under the facet for just a second - then rub the shampoo and water between your hands. Next, apply the shampoo to your roots. This wash will not create suds. In order to get suds your hair needs to be able to absorb the shampoo. Leave the shampoo in for one to two minutes. While my shampoo sits, I like to use this time to wash my body. By the time I’m done, my hair is ready to be rinsed. After you’ve rinsed you hair, wring any excess water out. Get your shampoo out again, add water, and this time apply to all of your hair. I still start with my roots, and then make my way down to my ends. You will also leave this shampoo in for one to two minutes. I shave my armpits while I’m letting my shampoo do its job. After you’re done, rinse your hair well and wring excess water out. If you’re using a masque, then you usually apply it after your second wash, unless the bottle says differently. For example, I use my Replenish Masque after my second wash, but I use my Charcoal Gelee masque before I wash my hair. Masques should be applied from the mid-shaft to your ends and left on for 5-10 minutes. While I’m letting my masque soak in, I shave my legs. Having a masque on makes me feel like shaving my legs is a little more glamorous! Finally you’ll finish your hair routine with conditioner! Again, apply conditioner from mid-shaft to ends. Avoid putting the conditioner on your roots. Let the conditioner sit in your hair for three to five minutes. I use this last step in my hair washing routine, to wash my face. Here’s an extra little tip! Wash your face twice. I learned this tip from an esthetician and since I’ve implemented it my face has been so much clearer! If you want to find out which products will work best for you, take my hair quiz!